Buffalo Gap, Texas. Image available on the Internet and included in accordance with Title 17 U.S.C. Section 107. Painting, Buffalo Gap by George Bickerstaff. Image available on the Internet and included in accordance with Title 17 U.S.C. Section 107. BUFFALO GAP, TEXAS. Buffalo Gap, an incorporated community, is at the intersection of Farm roads 89 and 1235, thirteen miles southwest of Abilene in central Taylor County. It was founded in 1857 and has had a post office since 1878. The Callahan Divide, the topographic boundary between the Brazos and Colorado basins, crosses Buffalo Gap from east to west. Elm Creek passes through and once served as a watering hole for buffalo. The present Buffalo Gap highway (Farm Road 89) follows the old Center Line Trail, which was surveyed in 1874 and ran from Texarkana to El Paso. Another major road entered the county on the south side of the mountains and passed through Buffalo Gap in the direction of Fort Phantom Hill. The road forked at Buffalo Gap; one branch led southwest to Pecos County and the other to Tom Green County. Buffalo traveled through the area on the way to the high plains. The earliest history of Taylor County centers around this gap in the divide, where in the 1860s and 1870s buffalo hunters made winter camp and from there transported their kill to Fort Griffin and other convenient centers of trade. Buffalo Gap Cemetery Historic Marker. Image available on the Internet and included in accordance with Title 17 U.S.C. Section 107. 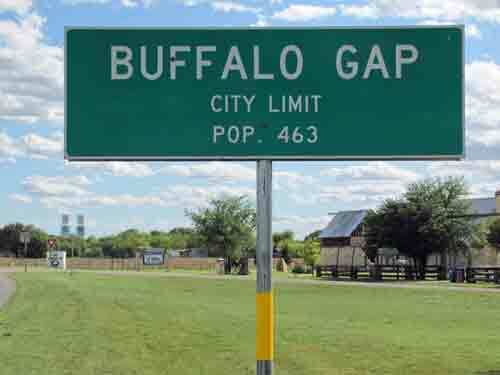 As it was the only town in Taylor County, Governor Richard B. Hubbard, acting Texas secretary of state, approved the selection of Buffalo Gap as the temporary county seat of Taylor County, on April 30, 1874. On July 3, 1878, this action was formalized. Twenty days later the judge, sheriff, clerk, and commissioners met. The first general public election was held with eighty-seven voters. 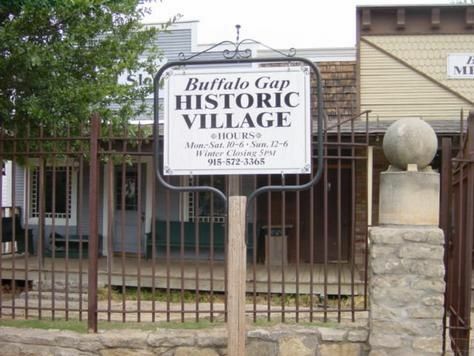 By 1880 Buffalo Gap had 1,200 people, a drugstore, a carriage and blacksmith shop, a big hotel, a jail, three or four grocery stores, and a saloon. Buffalo hunting was popular in 1875. The carcasses sold for five to fifteen dollars, and the bones were used to refine sugar (see BONE BUSINESS). In 1895 the Santa Fe Railroad was built through town. Buffalo Gap Historic Baptist Church. Courtesy of Joy Lewis Photography and the Abilene Reporter News. Image available on the Internet and included in accordance with Title 17 U.S.C. Section 107. In 1883 the cornerstone of Buffalo Gap College was laid, and documents pertaining to the times were sealed within the rock. Later, vandals tore out the stone and removed the contents. This Presbyterian college, the first formal attempt at higher education in Taylor County, opened in June 1885. Buffalo Gap called itself the "Athens of the West." The Baptist church at Buffalo Gap is the oldest Baptist church in Taylor County. About 1885 Marshall G. Jenkins began a weekly paper, the Buffalo Gap Live Oak, and in the mid-1890s the Buffalo Gap Messenger was circulated. 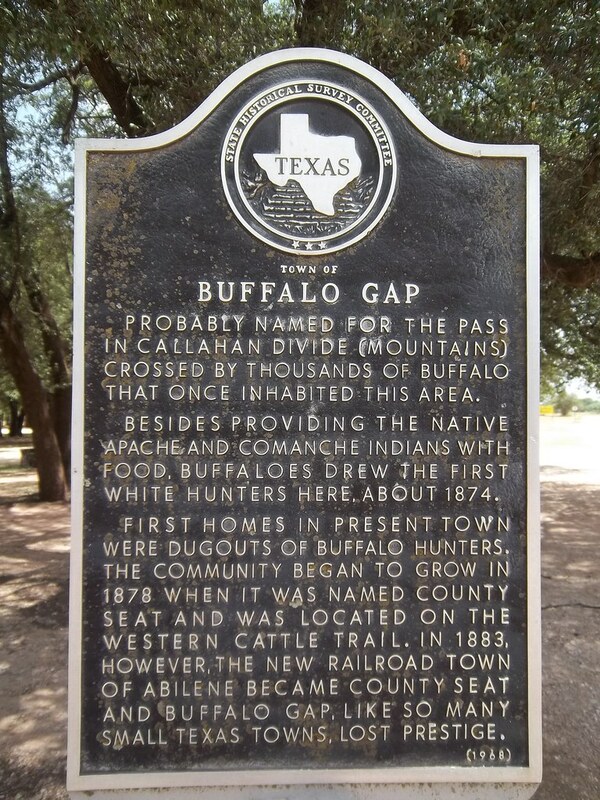 Buffalo Gap Historic Marker. Image available on the Internet and included in accordance with Title 17 U.S.C. Section 107. When the Texas and Pacific Railway established headquarters in Abilene, a competition to be county seat began, and in 1883 Buffalo Gap lost the battle. By 1884 Buffalo Gap had decreased in population to 600. Presbyterian, Methodist Episcopal, Baptist, and First Christian churches were established in the community, which also had a newspaper, sixteen businesses, and a high school. In 1890 the population had dropped to 300 and the number of businesses to seven. In 1892 Buffalo Gap had a population of 400, eleven businesses, Presbyterian and Methodist churches, and Buffalo Gap College. The college declined, and its charter expired in 1902. In 1914 the town reported 500 residents, ten businesses, and a bank. Between 1925 and 1980 the population fluctuated between 250 and 400 and businesses between two and twelve. In the 1930s Buffalo Gap had five churches, a number of farms and dwellings scattered along the main roads, and a camp and small park. In 1990 it had 409 residents and six rated businesses. Buffalo Gap Historic Village. Image available on the Internet and included in accordance with Title 17 U.S.C. Section 107. Buffalo Gap Historic Village buildings. Image available on the Internet and included in accordance with Title 17 U.S.C. Section 107. The town has carved out an identity as an "old-time" cultural and commercial center. In the 1920s its Old Settlers Picnic was a well-attended annual event. The Ernie Wilson Museum of the Old West was founded in 1956 by Enrie Wilson. Dr. R. Lee Rode and his wife Ann, purchased the Old Buffalo Gap Jail and Courthouse in 1970 and restored it with help from the community. The native limestone jail dates from 1879; the sandstone blocks were concave in the center and mortared together with cannonballs to keep prisoners from chiseling their way out. The jail is listed in the National Register of Historic Buildings. 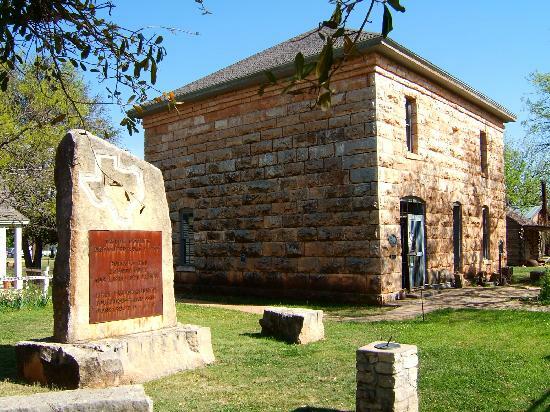 The museum is named for its first curator, who was also a lawyer and publisher of the Buffalo Gap Messenger. In the 1990s this museum became part of Buffalo Gap Historical Village. The McWhiney History Education Group, purchased the village in 1999 and currently operate it under the direction of site manager Heather Reed. Abilene Reporter-News, April 27, 1954, March 14, 1961, October 29, 1978, March 15, April 24, 1981, April 18, 1982, June 22, 2014. Buffalo Gap Messenger, June 16, 1961. Sam L. Chalk, "Early Experience in the Abilene Country," West Texas Historical Association Yearbook 4 (1928). Tommie Clack, "Buffalo Gap College," West Texas Historical Association Yearbook 35 (1959). Marshall Jackson, "Organization of Taylor County," Bulletin of Local Genealogy and History Published by the West Texas Genealogical Society 6 (April 1964). Vertical Files, Dolph Briscoe Center for American History, University of Texas at Austin (Buffalo Gap, Buffalo Gap College, Ernie Wilson Museum of the Old West). Juanita Daniel Zachry, A History of Rural Taylor County (Burnet, Texas: Nortex, 1980). Handbook of Texas Online, Susan J. Nix, "BUFFALO GAP, TX," accessed April 20, 2019, http://www.tshaonline.org/handbook/online/articles/hlb60. Uploaded on June 12, 2010. Modified on March 14, 2016. Published by the Texas State Historical Association.